An Interview with Dave Sears who was in the prairies and moved to Vancouver in 1934. Davediscusses golfing and golf courses in the Greater Vancouver area: Gleneagles Golf Club, Langara Golf Club, Cedarcrest, Pacific Northwest Golf Association. An Interview with Esmond (Bud) Lando who talks about golfing at Cedarcrest Golf Club among other topics. Photograph depicts golfers at Jericho Golf and Country Club.Seven golfers gathered on fairway behind sand trap; fairway, trees, and residential area in background. 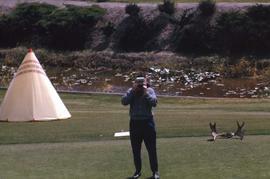 Photograph depicts golfers at Jericho Golf and Country Club.Eight golfers gathered on or around golf green; fairway in foreground; English Bay and North Shore mountains in background. Photograph depicts golfers at Jericho Golf and Country Club.Six golfers walking on fairway, away from tee off point in foreground of image; English Bay and Vancouver skyline in foreground of image. Colour Kodachrome II 35mm slide depicts a man, possibly Dr. Irving Snider, taking a picture of the photographer of this image. There is a teepee on the left of the image and moose horns on the right.